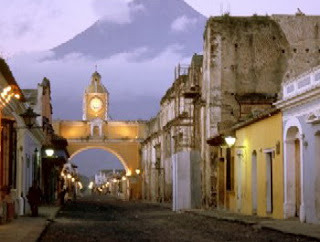 Guatemala can be one of the attractive tourist destination. There are many wonderful tourist attractions in Guatemala, exotic and wild. The beauty of the land is is very spectacular and amazing, mountains, lakes, beaches to forests. Guatemala has a rich culture from the long mix of elements from Spain and the native Maya people. This diverse history and the natural beauty of the land have created a destination rich in interesting and scenic sites. There are many volcanoes in Guatemala, most of them active. Amid these mountains, Guatemala's landscape is coursed with caves, caverns, sinkholes, and underground rivers. Non-mountainous regions of the country include the narrow Pacific and Caribbean coastal plains, and a limestone plateau in the Petén, which is geographically part of the Yucatan. Incomplete if you visit Guatemala without a visit and enjoy the beauty of the Santa Maria Volcano. There are two hiking trails that you can easily and safely through to reach the top of Santa Maria, from Ipala and Pacaya, and every footstep you will be treated to an awesome sight. Especially if you start your journey in the afternoon, early evening view of the sky at the top of Santa Maria is very exotic. And when night comes the constellation will walk to the door of your bedroom. From the top of Santa Maria you also can watch and enjoy the beauty of the lava lake (crater) Gunungan Santiago, a volcano is still active and is located at the bottom of Mount Santa Maria. Semuc Champey which means 'holy water' a pool composed of several small ponds. With the combination of a bright green color, has a small waterfall and accompanied by a variety of biological diversity and tropical forests flanking life. The pool of Semuc Champey flow slowly from a rocky plateau, river-Cahabon underground river located at the top of the pool, fused into a single flow along 400 meters down. 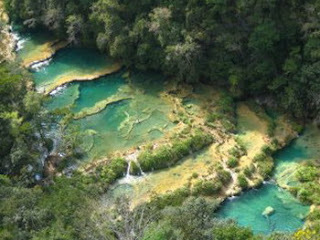 The existence of cliffs and steep rocks and steep stream pool of Semuc Champey, making it more exotic and wild. The Pacific coast of Guatemala is not inferior to that existing in neighboring countries, quiet but still dangerous. Just imagine the pounding of the waves hitting the reef and split into many directions. 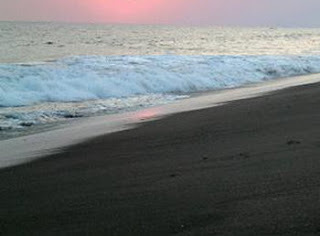 Or waves that drenched black volcanic sand and flying pelican birds passing by, while you enjoy grilled fish and fresh tropical coconut water. Although Antigua is not a natural tourist destination, because we only get ancient buildings that still leaves beauty standing before us. Buildings in Antigua is a legacy of Spanish colonialism in South America, which is now turned into souvenir sales centers and various other shopping. In addition to being a rallying center for the shopping enthusiast, this region is a magnet for photographers to capture the moment and the objects contained in it. 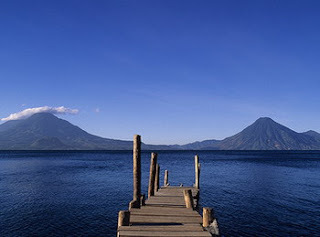 Lake Atitlan is one of the most beautiful lakes in the world. This large lake has a depth of 1,000 feet and is located surrounded by volcanoes. However, the beauty beyond the name "Atitlan" (where the rainbow, get the beauty of its color). Surrounded by volcanic mountains, Atitlan was surrounded by some of the Maya civilization, which adorned the city with a variety of patterns and colors, an artistic tradition.